One of the most important factors in the health and well being of your Leopard Gecko is a healthy diet. Leopard Geckos are insectivores, they prey on insects, such as spiders, moths, mosquitoes, and worms. Adult geckos can be fed live prey every other day while baby leopard geckos should be fed daily. This is not always the case, but it is a pretty good rule of thumb. You can also feed your gecko crickets, but when giving a gecko crickets as prey, you need to make sure that you use crickets that are small enough for your gecko to hunt. Two appropriately sized mealworms for each inch of the geckos length is a good amount. but you can treat your pet to waxworms or superworms once a week. Although some geckos have been known to have a sweet tooth and enjoy eating fresh fruit or even honey. They should be given live insects that are small enough for the gecko to deal with. You can feed your gecko anywhere from 4 to 8 crickets at one time, depending on the size of your gecko and the size of the crickets. 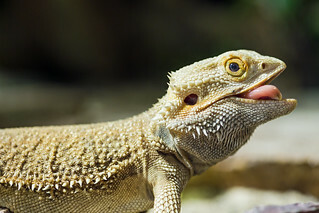 If the crickets aren't eaten within a couple of hours they should be removed and used for the next feeding, so that they don't cause your gecko any unnecessary stress. It is normal for geckos to eat the skin that they shed, so they may not always need the same amount of food for each feeding. Super-worms, mealworms or anything else that can be contained in a dish can be left within the cage without putting the gecko in any danger. If you wish, as a treat you can offer your adult gecko an occasional tiny pinkie mouse. One that is only a few days old will be little enough for a fully grown gecko to manage. In fact, pinkie mice are a wonderful choice to offer breeding females. Wax-worms are also a good treat for your gecko however, because wax-worms can become additive for geckos, they should only be given sparingly. Even though geckos love wax-worms, they are very fattening and generally unhealthy for geckos. The prey that you offer your pet should be no larger than half the width of your gecko's head, this will ensure that your gecko doesn't choke on it. The skin that the gecko sheds, and then eats, does help to provide them with protein and other healthy nutrients. One of the best ways of keeping your leopard gecko healthy in regards to feeding it, is to gut-load your geckos prey 24 hours prior to feeding it to them. Gut-loading is feeding the crickets or other insects a highly nutritious, high quality meal prior to feeding them to your gecko. Offering your gecko a healthier insect in turn makes a healthier gecko. You can buy a feed the insects things like chick or hog mash, fruits, vegetables and grains. They also make and sell products that come in a powdered form and can be fed to the prey. Along with gut-loading, you can offer your gecko calcium and vitamin supplements by sprinkling the prey with powdered supplements prior to feeding them to your gecko. 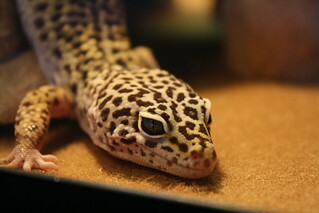 Calcium and vitamins supplements are very important to the overall health of your leopard gecko. Dusting the prey does run the slight risk of the cricket cleaning it off or even getting the dust in your geckos eyes. So, gut-loading and leaving the powder in a lid might be best. Dusting is also a good way to enrich the diet of baby leopard geckos and breeding females. Water should also be given to your gecko and kept fresh at all times. Stagnant water is a breeding ground for bacteria which can lead to illness in your gecko so the water should be changed frequently. Debbie Miller is a pet lover and leopard gecko expert. Leopard Geckos are nocturnal, ground-dwelling reptiles that were originally found in the deserts of Pakistan, India, Afghanistan, and Iran (although they live in the desert, their natural substrate is not sand, as I will discuss later under substrate). 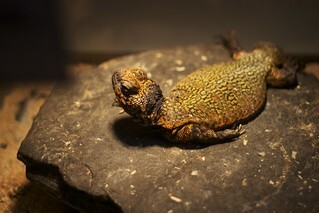 The scientific name is Eublepharis macularius (which means "true" "eyelid" "spot"). They are one of the few geckos that actually have eyelids, and they naturally have spots. There are many different morphs of Leopard Geckos that I will go into in more detail later. 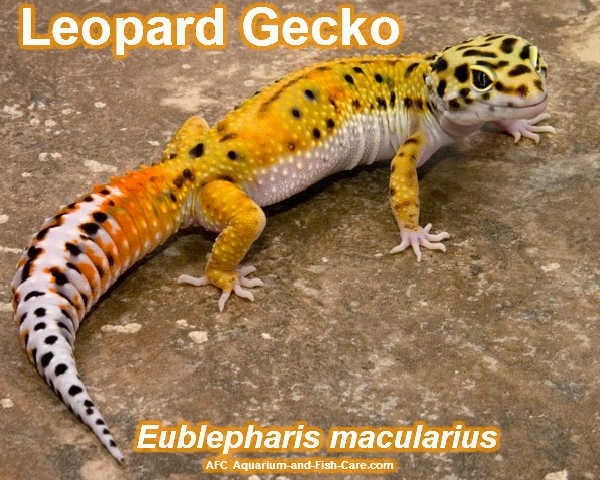 Many people now breed Leopard Geckos, and you can purchase them at a local pet store (or through breeders). They may live up to 20 years if properly cared for, and reach an average size of 8-10 inches when they reach adulthood (approximately 1-2 years into the gecko's life). First things first, you should never house multiple male Leopard Geckos together. They are territorial and may fight each other. You shouldn't house a female and a male together either, unless you want babies. However, you can house multiple females together, but you must watch them carefully because there can be situations where one may be a leader. Some signs of "bullying" would be marks on one of the geckos, one getting more food than the other, or one of the geckos getting a good bit larger than the other. Next question one might have is, "How big should my tank be?" Well this depends on how many geckos you plan to house in the tank. A 10 gallon tank would be on the small side for one gecko, but it works. My opinion is that a 20 gallon tank works best for 2, maybe 3 geckos, and a 30 gallon tank can fit up to 4 or 5 (this area is debated, so the less geckos, the safer). I do not suggest you ever house more than 5 geckos in one tank. Another thing to consider when purchasing a tank is that Leopard Geckos don't climb as much as other geckos, so it is better to buy a tank with more surface area. For example: A 20 gallon tank (24" x 12" x 16") meaning 24" by 12" surface area, compared to a 20 gallon long (30" x 12" x 12") which has 30" by 12" surface area. You could get those two tanks for the same price, but the 20 gallon long would be better choice. When it comes to feeding, babies/juvies eat more often than adults because it is important for them to grow a big healthy tail. A good rule of thumb to go by is once a day for any gecko 1 1/2 years and every other day for older geckos. You should let your gecko eat as much as he or she can in 15 minutes. They have good judgment and will not eat more than they can. When they are younger, they may eat too much and regurgitate the food. This is just a learning process and doesn't hurt your baby, it should teach them not to eat that much. When your gecko grows older you should keep feeding it as much as he/she can eat in 15 minutes, but only feed it every other day. A good rule of thumb to use is don't feed anything longer than the width between your geckos eyes (or 3/4 of their head). This will keep your gecko from swallowing something too big and choking, although they usually regurgitate. To learn more about what to feed your geckos, continue reading through the next couple of sections. Has a fat tail (it is OK if younger geckos don't have fat tails, as they are still growing). You should always check for signs of unhealthiness. Also, if you get a new gecko (or geckos) and you are planning to house them with another gecko that you already had or you just bought, you should "quarantine the new gecko(s). This is a process where you take the new gecko and put him in a tank by himself for about 3 months. If you don't do this, and your gecko came with a disease, the disease would spread to the other gecko and both of them would have died. After the 3 months you can safely house that gecko with another one. This is just a safe way to determine if a Leopard Gecko is "disease-free". For a complete article including information on breeding and morphs, please check Gecko Information and read our Leopard Gecko Care Sheet.